Great Titan Wins, #81-90 | Detroit Titan Basketball! 90. 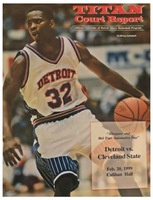 Feb. 20, 1999: Detroit 78, Cleveland State 66. 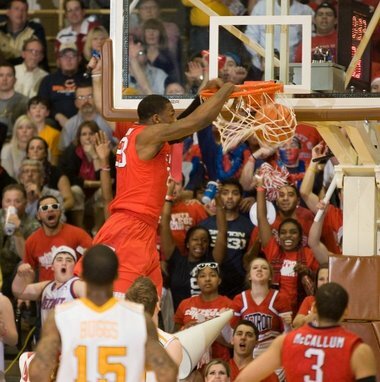 Rashad Phillips scored 24 as the Titans rallied from a halftime deficit to clinch their only outright Horizon League regular season championship to date. 89, Feb. 27, 1960: Detroit 101, Seton Hall 77. The Titans solidified their chances of their first ever post-season bid-which they got- with a late February thumping of a good (16-7) Seton Hall team. The Pirates had not given up more than 83 points all season. The Titans scored the game's first 8 points and were never headed. Dave DeBusschere had 37 points and 17 rebounds, and Charlie North and Ray Albee added 23 and 20 points, respectively. 88. Dec. 1, 1977: Detroit 76, @ Toledo 64. Terry Duerod hit 12 of 14 shots from the floor including 10 straight at one point, as Detroit won at Toledo to launch the highly anticipated 1977-78 season. The Titans shot 56% for the night in a convincing win over a very good Rocket club that would finish the season 21-6. Duerod finished with 25 points, while Kevin Kaseta and Terry Tyler each added 13. 87. Feb. 16, 2013: Detroit 84, @ Valparaiso 74. Trailing by 15 midway through the second half, the Titans went on a 36-11 run to wipe out the league leading Crusaders in Valparaiso. Jason Calliste and Nick Minnerath each scored 21 and Evan Bruinsma had a double-double in the Titan victory. The game was a near mirror image of an earlier Valpo win in Detroit, in which the Crusaders rallied from 20 down in the second half to nip the Titans 89-88. The Crusaders would finish 26-8 after losing to Michigan State in the NCAAs, while the Titans settled for the NIT. 86. Dec. 6, 1997: Detroit 77, Western Michigan 59. The Titans used a blizzard of three pointers to crush the previously unbeaten Broncos in Detroit. The Titans hit 56% from behind the arc, including 5 consecutive threes in a six-minute span of the second half to blow the game open. Derrick Hayes had 17 points and Brian Alexander 10 points and 11 rebounds for Detroit. In the Titans’ long rivalry with WMU, this was one of the most impressive Titan wins. The Broncos would join the Titans as at-large NCAA selections at the end of the year, beating Clemson in the first round. 85. Dec. 21, 1978: Detroit 76, @ Iona 72. The Titans, led by Terry Duerod and Earl Cureton, defeated Jimmy Valvano's Iona squad, led by Jeff Ruland, in a bruising match-up in Madison Square Garden. The Titans led by as much as 14 in the second half before a 19-4 Iona run gave the Gaels a 70-67 lead with six minutes to play. But Terry Duerod scored 6 points, including a pair of key free throws with 22 seconds to play, as the Titans finished with a 9-2 spurt to put down the Gaels. Duerod led Detroit with 28, while Ruland had 22 for Iona. The game was part of a Garden double header with Louisiana State-Army in the first game. Iona would finish 23-6, losing in the NCAA tournament to eventual Final 4 team Penn. The Titans lost to Lamar in the NCAAs. 84. Feb 1, 1962: Detroit 82, @ Michigan 74. Unlike Michigan State, which was for years a regular on the Titan schedule (the Spartans have played UD 61 times), Michigan has always ducked the Titans. The teams first met in 1919, with Michigan winning 39-18, and did not play again until Christmas of 1958, when Michigan beat UD 93-68 in the finals of the Motor City Tournament. The schools met for only the third time in 1962, as the Titans travelled over to Ann Arbor and gained their first win ever over the Wolverines. UD was fast out of the gate, racing to a 43-29 halftime lead and coasting home. Dave DeBusschere led the Titans with 23 points and the same number of rebounds. This was not a good Michigan team, finishing 7-17, but it was still a most satisfying win for the NCAA tournament-bound Titans. *83. Jan. 28, 1920: Detroit 30 39, Toledo Albion 3. The Titans held a good (8-3) Toledo team to just 3 points, the fewest allowed in Titan history. 82. Dec. 28, 1938: Detroit 25, Santa Clara 23. Santa Clara, a major western power of the time, launched a long Midwestern road trip over the 1938 Christmas holiday break with a game at Detroit. Both teams started slow, leading to an 8-8 halftime score. Santa Clara then led most of the second half, and was up 23-19 with three minutes to play. But Bob Calihan hit a pair of baskets to tie it up, and Jack Liana hit a set shot with 20 seconds to play to hand Santa Clara its first loss of the year in 5 games. The Broncos would eventually finish at 15-5, winning the Northern California Conference. 81. Dec. 29, 1956: Detroit 94, Northwestern 84. UD upset Northwestern to win the Motor City Tournament as Bill Ebben scored 40 points. (The Titans' official Media Guide lists this as the first game in which a Titan ever scored 40 points; however, the 1953 edition of the Tower Yearbook claims that Guy Sparrow scored 42 that year against John Carroll.) Mike Walsh added 20 for the Titans, who raced to a big early lead and held off repeated Wildcat rallies in the second half. Great detail in this list. That match up between Ruland and Cureton must have been a good one to see. Ruland was a very good NBA player before he tore up his knee and lost some of his effectiveness. I've already had to edit this. Trying to follow up on game #83, due to a noted discrepancy in the score on Titan and Rocket records, it appears the Titans' best defensive ever may have come in another game that year. See above. Program from the #90 greatest win, the victory over Cleveland St. that clinched an MCC regular season crown.